This recipe for grilled ancho butter shrimp has the great flavor of dried and roasted poblano peppers with a slight bite of cayenne heat. As an added bonus this recipe can be changed to a salt free grilled shrimp recipe by simply substituting salt free butter. 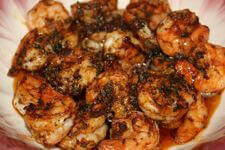 Whether Grilled or Smoked, Ancho Butter Shrimp Is Darned Tasty! 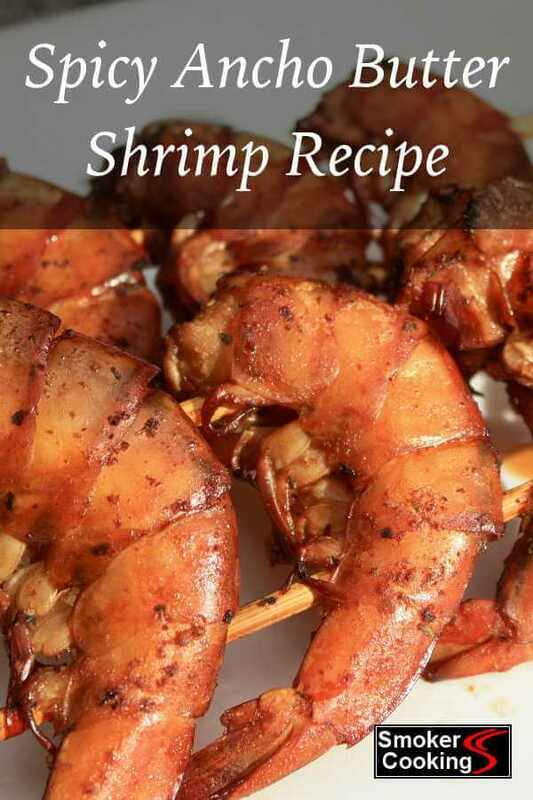 This recipe can be whipped up in about an hour after the shrimp are thawed. No salt is used in the seasoning mix, so the only salt is in the butter. By replacing the regular, salted butter with unsalted butter, it becomes great for a low sodium diet. What is Ancho Chili Powder? Ancho chili powder is made from a single type of chili pepper, the poblano. After ripe poblano peppers are dried, they're lightly roasted, bringing out earthy undertones of flavor. The roasting also gives the peppers a bit of smokiness. Poblano peppers are positioned very low on the Scoville Scale of pepper heat, somewhere between sweet bell peppers and jalapenos. When used in recipes, the ancho powder made from these peppers primarily adds flavor to the dish, and very little heat. If you have no ancho chili powder, there are a couple of different choices you could use as substitutes. Chipotle powder would provide the hint of smokiness and some pepper flavor, but it's quite a bit hotter than ancho powder. If using powdered chipotle, delete the powdered cayenne from the ingredient list. Smoked paprika would also be acceptable to use in a pinch. Give the paprika a taste before adding the cayenne pepper, since the amount of heat found in different types of paprika can vary. It's really easy to make a batch of ancho chili powder yourself, and the only ingredient is dried poblano peppers. Equipment needed is a heavy skillet and a spice mill (or a coffee grinder). 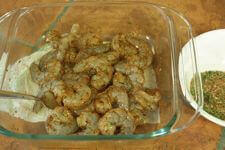 Use the freshly ground powder immediately in your ancho butter shrimp recipe for the best flavor. Combine the dry ingredients. For a spicier shrimp recipe, double the amount of cayenne pepper. Now's the time to light the charcoal, so it's good and hot when grilling time arrives. 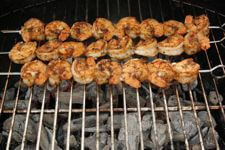 Preheat your gas grill right before you put the shrimp on the skewers. Melt the butter in a small sauce pan, heating over low heat until the solids separate and the butter just begins to brown. Skim the foam from the top of the butter as it's clarifying. The solids will sink to the bottom of the pan. 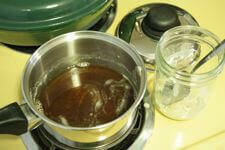 Pour the melted, brown butter into a heat proof bowl, leaving the browned solids in the pan. 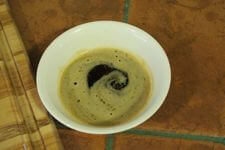 Add half of the dry ancho seasoning mix to the butter. Peel the shrimp. The 21-25 size is perfect for this recipe, since each one makes a nice sized bite. Remove any veins you find while peeling the shrimp. 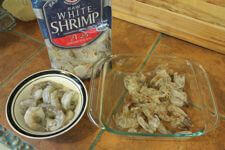 Season the peeled shrimp with the remaining dry ancho seasoning mixture. 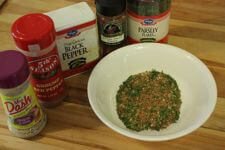 Mix them well after sprinkling on the ancho seasoning mix so all sides are coated evenly. Thread the shrimp onto skewers. When using the 21-25 size, three or four skewers will be about right. My skewers are flattened so the shrimp won't spin around easily. If using bamboo skewers, soak them in water first. 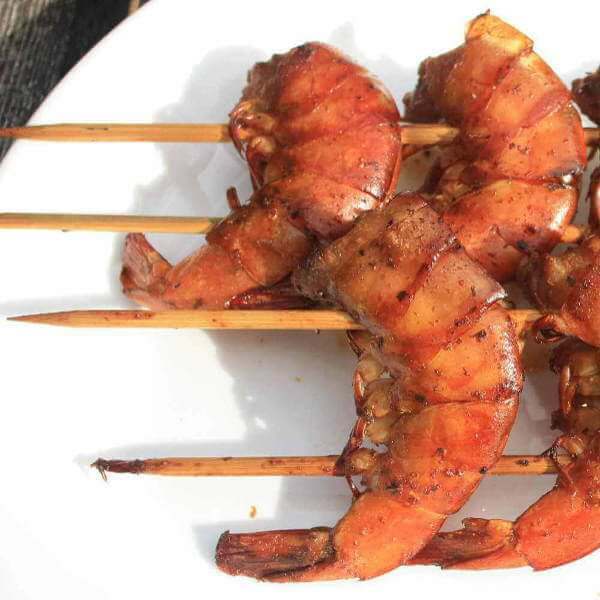 You can use two skewers per kabob to keep the shrimp aligned. To get some great smoke flavor, lay a foil packet containing about 1/4 cup of pecan chips directly on the hot charcoal. When the packet begins smoking, place the shrimp skewers directly over the heat. Grill for two minutes on the first side. Turn the shrimp over, grilling for another two minutes on the other side. If you're grilling larger shrimp, give them an extra 30 seconds to one minute on each side. 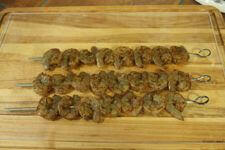 With smaller shrimp, grill about one and one-half minutes per side. Shrimp are done when the shell has changed to a pink color and the flesh has become opaque-white in color. 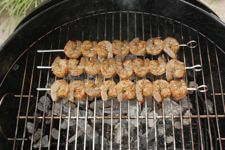 To prevent them from being tough and rubbery, remove them from the grill immediately when you see the shrimp reach this point. 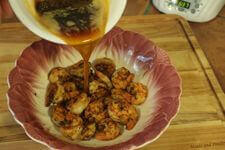 Slide the grilled shrimp off of the skewers into a bowl, then pour on the ancho seasoned brown butter. Give them a stir so the shrimp are all coated with buttery goodness! And that's that! 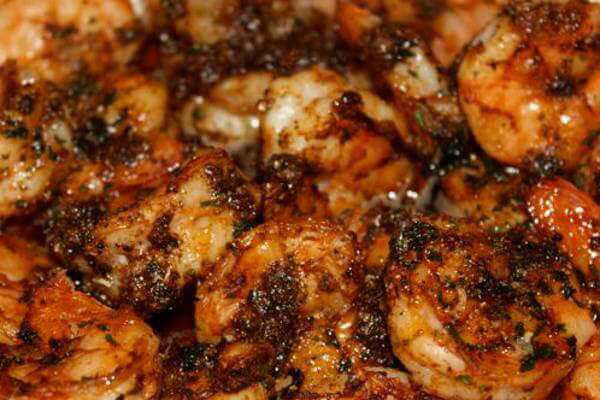 You now have a pound of succulent grilled ancho butter shrimp. These little goodies are great as appetizers or for a quick snack on Saturday afternoon. These spicy shrimp can also be served over brown or white rice, with a side of steamed broccoli to make a really nice, yet simple meal. And be sure to have some chewy French or Italian bread at the ready, so you can use it to soak up any of that buttery ancho sauce that might be left in the bottom of the bowl!